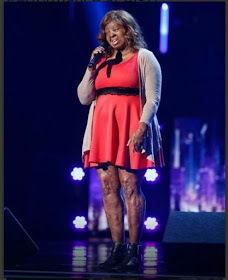 Nigerian born plane crash survivor Kechi once again wows judges and audience at the judges-cut stage and performed a moving cover of John Hiatt‘s “Have a Little Faith in Me“. How ever, her journey ended at this stage, and she is happy she got this far. .
Simon especially, after her performance stated that she made it to this stage not because of her story but as a direct result of her talent. .
Kechi shared some photos from where she watched the show herself with kids at the Shriner’s Hospital for Children at Galveston. .